A range of civil society organisations have issued a public statement opposing the United States Army’s proposed grant of an exclusive licence on technology necessary to produce a Zika vaccine to French pharmaceutical company Sanofi. The letter cites concerns that the exclusive licence might violate US law and could lead to high priced medicines as consumers buy back taxpayer-funded research. 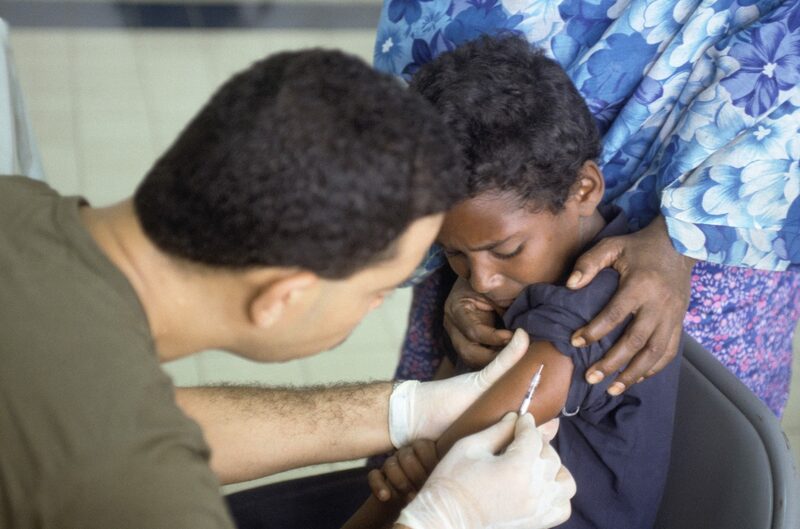 A Somali child receives a polio vaccination at the Tunisian hospital in Mogadishu. The 12 January letter to the Commander of the US Army Medical Research and Materiel Command (USAMRMC) and US Army Medical Command was signed by: Knowledge Ecology International, American Federation of State, County and Municipal Employees, People of Faith for Access to Medicines, Public Citizen, Social Security Works, Universities Allied for Essential Medicines, and Dean Baker, economist and co-founder of the Center for Economic and Policy Research think tank. The Army and Sanofi were not reached for this story. The civil society groups expressed concern that publicly funded technology is being licensed to the private firm, which will be given exclusive rights to develop a vaccine. The organisations point to statements by Sanofi on the high potential profitability of the vaccine, which raises concerns about the ability of the general public and individuals in lower income countries to access this medicine. Zika virus is spread by mosquitoes common to Latin America and some parts of the southern United States, or transmitted through sexual contact with an infected person. While its symptoms are mild in healthy adults, it can cause severe birth defects when pregnant women are infected, and thus presents the possibility of a public health emergency. Under the terms of the Bayh-Dole Act and the laws it subsequently created, a federal agency may only grant an exclusive licence if the exclusivity is necessary to generate the investment required to create a usable product, in this case an effective vaccine. Sanofi has been given an additional US$43.2 million in public funding from the Biomedical Advanced Research and Development Authority, a public agency within the US Department of Health and Human Services, to support the development of the actual vaccine. The organisations in the letter point to this funding, and statements from Sanofi that they will seek further government funds, as a violation of the requirements of the law which would permit the awarding of an exclusive licence. Sanofi was likely selected because of its experience in creating a vaccine for the Dengue virus, which is similar to the Zika virus and spread by the same mosquitoes. In an interview with Statnews in February 2016, the corporation’s director of research touted this experience and the company’s existing personnel and infrastructure as a means to reduce several years from the timeline to produce a Zika vaccine. These resources could also be beneficial in reducing cost of late stage testing and manufacture of the drug, which can be significantly higher than earlier stages of testing. Awarding an exclusive licence prevents any other pharmaceutical company from using the Army’s research to develop a vaccine. Exclusivity would be desirable by the licensee, Sanofi, to protect any future development investment by the company from competition by outside firms. This licence effectively creates the guarantee of a monopoly for Sanofi, which the letter argues is further protected as Sanofi is allowed exclusive rights over its test data for 12 years under the Biologics Price Competition and Innovation Act. In order for a future competitor’s version of the vaccine to be accepted by regulatory agencies, it must prove itself to be biosimilar to the patented medicine. Vaccines are biologic drugs, meaning that they were derived from living sources. In order to qualify as “biosimilar”, a drug must prove itself to have no meaningful clinical differences from the existing vaccine. The letter argues that protection of clinical trial data would present a barrier to entry for a biosimilar version of the medication. The letter further points out that the vaccine created by Sanofi would be granted a priority review voucher by the US Food and Drug Administration [corrected]. The voucher system is intended to promote research and development of neglected tropical diseases by giving companies with the voucher a faster review and approval process, usually only six months. The voucher itself is valuable, as a company may choose to sell it to another firm. These vouchers have been sold in the past for hundreds of millions of dollars. While the program may incentivize development of drugs for diseases otherwise seen as unprofitable or low-priority, criticisms have been levied against it. Some advocates for medicine access object to the fact that companies are not required to ensure access at an affordable price or prove that they conducted research. Kim Treanor is an intern at Intellectual Property Watch. Kim is a student in the graduate program of International Affairs at the New School in New York, where she studies development, trade and public health. "Groups Seek Assurance Of Affordable Zika Vaccine From US Army Exclusive Licence" by Intellectual Property Watch is licensed under a Creative Commons Attribution-NonCommercial-ShareAlike 4.0 International License.